Fast, efficient, bidirectional visual editing and remote control. 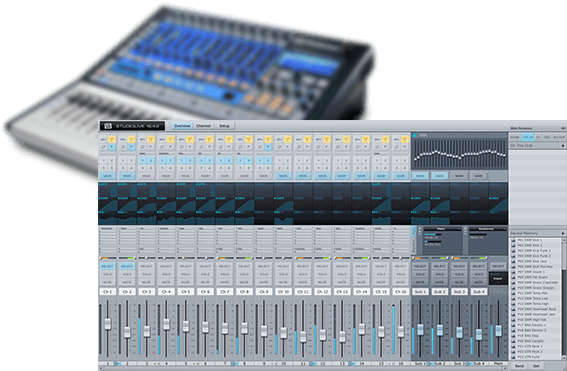 Accessed as a StudioLive® 16.0.2, 16.4.2, or 24.4.2 mixer’s Device window in the free PreSonus Universal Control application, Virtual StudioLive (VSL) for Mac® and Windows® is a feature-rich, intuitive, bidirectional control/editor/librarian application for first-generation StudioLive mixers. 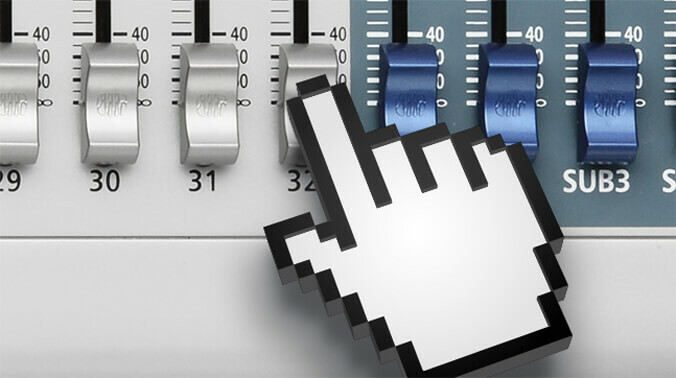 You can drag-and-drop settings and scenes to and from the browser, as you would in Studio One®. Move a VSL control, and you’ll see the value change in the mixer, and vice versa. 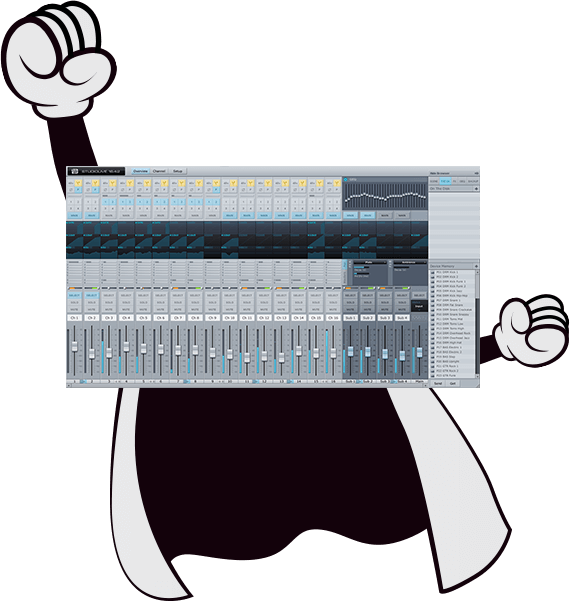 Edit visually, using a virtual image of the mixer—with the addition of editable compressor and EQ curves. You’ll be amazed at how quickly and efficiently you can work. Load settings quickly with drag-and-drop. With VSL, controlling StudioLive levels; mutes and solos; Fat Channel processing; effects; and graphic EQ is as easy as drag-and-drop! Load Fat Channel settings by simply dragging them onto the channel or mixer overview, either as a complete channel strip, or as individual gate, compressor, and EQ presets. Or apply a new scene to the whole mixer by dragging it onto VSL's virtual mixing surface from a browser list that you can show or hide. Save virtually unlimited scenes and settings and name them and rearrange them in the browser. You can even drag presets out of the browser and share them with other StudioLive owners. Bidirectional control means you don't have to choose. Since VSL control is bidirectional, fader moves and parameter changes made on the StudioLive are reﬂected in VSL in real time and changes made in VSL are instantly mirrored in the StudioLive. Save your Scene or other presets in VSL or create them in VSL and send them to the mixer’s memory. If you make fader changes in VSL, the fader values will change in real time on the StudioLive; put the mixer into Locate mode to see the new values on the channel meters and to compare where the StudioLive AI faders are relative to the VSL faders. Rational Acoustics’ highly regarded Smaart Measurement Technology™ is integrated directly into Virtual StudioLive, including the Smaart Spectra™ RTA and time-frequency Spectrograph. With Smaart-enhanced VSL and the StudioLive mixer’s EQs, it’s easier than ever to adjust your sound system to any room. StudioLive 16.4.2 and 24.4.2 owners can even use Smaart wizards to easily view the frequency-response trace of a venue, calculate and set delay-system timing, and verify output connectivity. With VSL, you can control your StudioLive mixer—or multiple StudioLive mixers—from your Mac or Windows PC. Network your computer with an iPad via Wi-Fi, and you can wirelessly control VSL using free StudioLive Remote for iPad, enabling you to control your StudioLive mixer from anywhere in the venue. VSL makes contractors into superheroes! If you’re a contractor supporting clients, you can take advantage of the ability to remote-control StudioLive mixers with VSL in multiple ways—some so powerful that your clients will think you're a superhero! Create named scenes and put them in any order you want in the VSL browser so that clients can load them by drag-and-drop. Control your laptop and VSL via the Internet, using third-party VPN software. Then use Smaart to remotely observe the spectral content of the client’s mix in real time and adjust the EQs on the client’s StudioLive mixer, even if you can’t hear the system. Manage multiple mixers in a facility from one laptop. So now that you’re finished reading about it, download free Universal Control with Smaart-enhanced VSL!